PennsylvAsia: Squirrel Hill's Sun Penang ordered to close by Allegheny County Health Department. 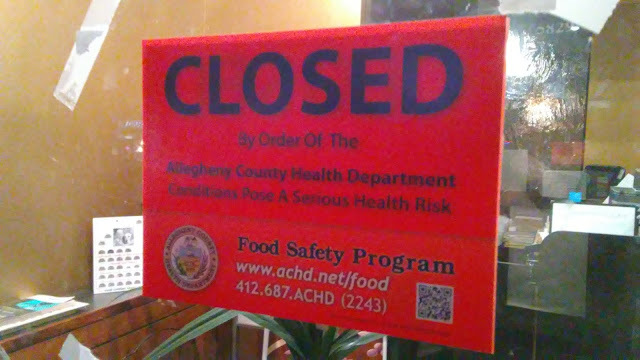 Squirrel Hill's Sun Penang ordered to close by Allegheny County Health Department. Sun Penang, an Asian restaurant in Squirrel Hill that delivers boxed lunches to nearby college campuses, was hit with a consumer alert by the Allegheny County Health Department because of numerous health code violations. Some of the problems at the Forbes Avenue eatery included foods held at unsafe temperatures, soiled food contact surfaces, dishwasher failing to sanitize and rodent activity. A rat’s nest, rat droppings and gnawed bags of corn starch were found, the inspection report noted. pre-ordered goods. You were not able to provide any delivery records. Cease and desist making direct food sales (effective immediately). Squirrel Hill restaurant Sun Penang and its owner were federally indicted by a grand jury today on charges that its workers were asked to forfeit back pay or work for no pay, according to a release from the U.S. attorney's office. U.S. attorney David Hickton alleges that Hsiao Yen Wu, 40, who also goes by the alias Sophia Wu, had agreed to pay back wages to her employees and provided information and copied checks to the Department of Labor's Wage and Hour Office in Pittsburgh in order to show authorities that she was in compliance. Federal authorities say Ms. Wu then ordered her employees to deposit their checks into her personal account or to work without pay until the restaurant recouped the backpay. The indictment also alleges that Sun Penang, located at 5829 Forbes Ave., did not pay its workers minimum wage or overtime pay during a one-year period from Jan. 1, 2013 to Dec. 31, 2013.